Dean Lang on a 38 mile ride in S. California, 8 months after accident. Photo: courtesy Dean Lang. 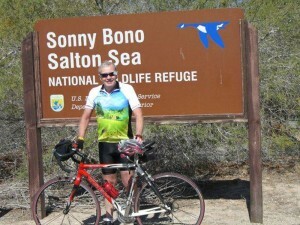 In 2009, Dean Lang was one of 3 cyclists that I featured in the August 2009 issue of Cycling Utah who completed a solo ride across the United States via the Adventure Cycling Association’s Southern Tier route. Dean did the ride in early 2007 at the age of 60. On June 28th of 2010 Dean had an accidental shooting that shattered his distal femur. Shortly after the start of his rehabilitation, he was diagnosed with prostate cancer. The following conversation discusses Dean’s life before and after that tragic night. Cycling Utah: Dean, describe what your cycling life was like before the accident. 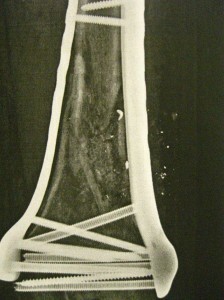 Dean's femur after the second surgery. Photo: courtesy Dean Lang. Dean Lang: Throughout the mid '80s, into the early 90s I cycled quite a bit, but mostly got away from it for awhile due to business and personal obligations. I had done a little bit of citizen racing and also participated in rides like the MS 150 back in those days. I always knew I would return to cycling some day, and in 2005 my wife and I purchased some new road bikes and really got (re)hooked. In 2006 I experienced my first tour with a friend, riding across Iowa, self-supported. I decided at that time that I really wanted to do a more ambitious tour, and was able to steal the time to solo tour across the U.S. on the Southern Tier in early 2007, again self-supported pulling a BOB trailer. It was a wonderful experience. A year or two later, my wife and I participated in the Bike Ride Across Nebraska (BRAN). Throughout the years, I've participated in numerous century rides, and all sorts of club rides. We also have a tandem and had a great time participating in a N.W. tandem rally. We've done a number of century rides on our tandem and singles, too. I guess I probably rode on average about 5,000 miles/year before my life fell apart. C.U. : I assume you are still having nightmares of the accident, but if you could, what were your thoughts immediately after the accident? Did you first think that you might be fully disabled? When did you realize you would not be disabled, and when did you decide that getting back on the bike to do what you did before the accident was possible? D.L. : It's interesting how various people deal with traumatic experiences. For me, my first thought after inserting a .40 caliber round through my left femur was: “Boy, am I going to catch a lot of grief over this, I'm really stupid.” My second thought was how fast our little kitty cat can move. My third thought was OUCH! I discouraged my wife from calling 911 because I (foolishly) thought I could limp out to the car and we could drive to the hospital. No way! As it turned out, I blew away between 2 and 3 inches of my femur, just above my knee. That was the evening of June 28th, 2010. I never considered that I wouldn't totally recover, but as I found out later, I was extremely lucky because I could have easily died, or totally lost the use of the leg. I missed my femoral artery by only about 1 cm. I'm told a severing of the femoral artery pretty much assures death from bleeding out. I also narrowly missed the nerve bundle that connects the nerves to the lower portion of my leg, which could have made my leg and foot inoperable, more or less dead. Luckily, I missed both and limited the damage to bone and muscle. After being stabilized at the E.R. at the University Hospital, I had a CAT scan. I couldn't believe how badly I mangled my femur. I literally pulverized away 5-6 cm of my femur and drove the ragged upper end down into the outside of my knee. It was really ugly and severely displaced. I was placed into an inflatable cast and stabilized for surgery first thing the next morning. I was provided some pain meds, but surprisingly not much. In surgery, Dr. Kubiak pulled my leg back into alignment, removed the bone fragments, placed some acrylic beads into the void area, and bolted a 10″ long strut from my upper knee area to above the good part of my upper femur with 6 screws. This was operation #1. The surgeon visited me most days during my recovery time at the hospital, and on his first visit I asked him if and when I'd be able to walk. He said to expect it to take about a year. Of course, my second question was about cycling, and he assured me if I work hard, I would be able to cycle again, too. He also informed me that I would need at least one more surgery to open up my leg on the other side, remove the acrylic beads, and insert some cadaver bone and screw in an even larger strut on the outside part of my leg. I ended up staying in the University Hospital for a total of 6 days. After that I was transported to a rehab facility in Sandy. I couldn't do much for myself, and needed help with pretty much everything. I did finally shower with the help of an aid, and in a few days I started rehab. I could not move my leg even one inch. In addition to the damage to my femur, I seriously damaged a big part of my quad muscle. The pain was pretty tough to deal with, but I was determined and started seeing small bits of progress. In a couple weeks I was able to get myself into a wheel chair, then use a walker, and eventually return home. I did have the second leg surgery in late July and it went okay–more hardware and stitches. This resulted in hosting two long struts (10″ and 12″) along with 12 real ugly screws and a chunk of some donor's femur (thanks, whoever you were). After the second leg surgery I had something like 79 stitches with a long incision on each side of my thigh. The doc also drilled into my pelvis to retrieve some bone marrow, and spun out stem cells to pack around the newly placed donor femur chunk. I knew recovery would take some time, and my leg was on nice and straight and was the correct length; I knew in my heart of hearts I'd be walking and cycling sooner than any of us expected. Everyone told me my excellent condition would contribute to my recovery, and it sure did. I continued rehab about 3 times/week for the next 3 months, and little-by-little, I gained strength and flexibility. I also engaged in rehab at home, pretty much every day. I didn't overdo it, but I pushed myself as much as I felt I could. Things were looking up. C.U. : You had, has you say, “more bad news”, shortly after your rehab started. What happened? D.L. : The Friday before I shot myself, I had an annual physical in which a blood test was performed. The day after my first leg surgery, as I was lying in bed recovering, my primary care physician called. She was sorry and amazed to hear about my accident. She said she regretted having to tell me that my blood test revealed a spike in my PSA (prostate specific antigen), often an indicator of prostate cancer. Just what I didn't need to hear. My poor wife immediately trekked over to Huntsman Cancer Hospital to set up an appointment with the Urologist. Janet scheduled a prostate exam for some weeks later, and after consultation, blood tests and a biopsy, I tested positive for prostate cancer. Bummer! I was told I could have the prostate surgery after my second leg surgery; so that would be my next challenge. Scheduled between leg surgeries 2 and 3 was my prostate surgery. That occurred on September 15. The procedure was conducted by Dr. Dechet from the Huntsman Cancer Institute. He used a DaVinci robot, which is essentially a remote control surgical machine with 5 rods that are inserted at about the waistline. The surgery went well, and in about a month I had recovered pretty well. I was able to return to rehab, but couldn't ride even a stationary bicycle due to the area involved. I was still hobbling around on crutches, but in about a month or so I started walking with a significant limp. That was 4 months after my injury, not a year. C.U. : What was the rehab like? D.L. : The rehab wasn't as tough as I had expected. The worse part was near the end of each session when the therapist would force my leg to bend as much as possible. When I first started, I couldn't flex my leg much more than about 60 degrees (from full extension of my leg). This limit of motion prohibited me from using the stationary trainer until I got to about 90 degrees. Once I was able to stationary cycle, my leg improved rapidly. I finally was able to very carefully cycle around our neighborhood a block or two in, as I recall, December. In February we pulled our R.V. down to S. California for several weeks and I eventually inched up to 35-40 mile rides. This was less than 8 months after my accident. My leg still hurt a lot, and I needed some of the hardware removed because it interfered with nerves and tendons. But, the doc wanted the strut to stay for at least a year. C.U. : Where are you now compared to before the accident regarding cycling? What are the residual complications such as remaining hardware, discomfort/pain, limp or limitations on the bike? What adjustments have you had to make on the bike? D.L. : I'm doing really well. My PSA is at zero, indicating that the cancer is under control. There were no indications that the cancer had spread beyond my prostate. They did remove my entire prostate and some adjacent tissue, just to be sure. My leg is about 90%, and improving daily. I still have a small limp, but that's getting better day-by-day. I had the left 12″ strut along with 6 screws removed exactly one year after the first surgery, but the inside strut is still there and will probably remain as long as it doesn't give me any problems. I'm extremely lucky for so many reasons. In October my wife and I rode the Katy Trail across Missouri along with our friends Eve (Bertran) Hales and her husband Don. We did approximately 30-35 mile days and it was easy. I'm looking forward to a century later this year, and feel I'll be back where I was a couple years ago. The only equipment change I made was to adjust my left cleat because Dr. Kubiak made my leg straighter than before. I can't say enough about the excellent care I received from both Kubiak and Dechet. Incidentally, Dechet is a cyclist and Kubiak is a rock climber. C.U. : I don't want to get into gun rights etc, but a lot of Americans own guns. Why do you? What are some of steps of gun safety that go along with gun ownership. Where did you go wrong? D.L. : My wife and I are not hunters, but we do enjoy target shooting, and still participate. It's complicated but the bottom line was I was careless; I broke every rule and it cost me, and my wife dearly. Poor Janet had to wait on me hand and foot for several months. She was also burdened with all of the household tasks. We were lucky in so many ways as I indicated. We had excellent insurance and benefited greatly from that. I think my medical bills totaled in excess of $150,000; we only ended up paying a reasonable deductible. Like cycling, guns present a certain amount risk. Nothing, nothing can substitute for good judgment and paying attention. I lost my concentration for a fraction of a second, and like with cycling, lack of attention can result in tragedy. I now handle a gun with a totally new level of respect and don't pull the trigger without thinking about all the rules of safety 3 or 4 times. I'd like to believe I employ the same level of safety to cycling, and everything else for that matter. I've learned to be more careful when it comes to everything now that I know tragedy can happen so fast and easily. I'm not ignoring the second chance I've been given. C.U. : During this time it must have been hard on your wife Janet to help with your care. I heard that some of your cycling friends helped out. D.L. : I'd like to thank all of those who stepped up and helped Janet and me through this challenge. Some from the cycling community include Zig Sondelski, Eve Bertran Hales, Fred Toensing, and Barb Hansen. We also had incredible support from so many others; family, neighbors and friends. That was so heartwarming and I can't thank everyone enough. Fred was there for each and every surgery to support both me and Janet, and Fred was at my side when the doctor called to advise me that I tested positive for cancer; he was very comforting. I'll never forget the support he provided. Zig came by often and forced me into his car for rides to get out of the house. He even purchased a used wheel chair and dragged me around everywhere on “field trips.” Zig lives a good distance from our house, and he made such a valiant effort to help out. Barb Hansen knew that I couldn't use a conventional trainer due to the prostate surgery, so she brought over a recumbent-style trainer that helped tremendously. Eve was a God-send for both Janet and me, also taking us out on field trips, making hospital visits, and bringing by candy, cards and lots of love. I'm one very lucky guy, and know all of these people only because of bicycling. It's a great community. C.U. : Thanks Dean for sharing your story. I’m very glad to hear that you are back on the bike and cancer-free. I am also glad you are able to express thanks to those that represented what the cycling community is all about.